Andrew L. Turay Jr P/k/a Dru Diamondz, born in Harlem, NY, began rapping in 1994. His hard work, dedication, showmanship and talent have helped him grow into a songwriter with style, charisma, and depth, while holding his own striving to making a name for himself as a solo artist and earning his way into the rap game. “It would make me proud to put out an album. Hip-hop is a way of life and I want to have my say”. 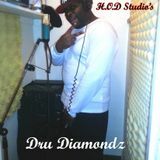 Drawing off of influences such as 2pac, Pimp c, Snoop dogg, Biggie, E-40 and Big Pun, Dru diamondz creates music with rhymes so potent, wisdom and feeling in his lyrics and strong social messages for today’s youth. Dedicated to his gift and delivering his own unique flow to hip-hop, he displays his art through a mixture of upbeat club songs, pop anthems and mix tape grooves, still sounding fresh to death as he does, rocking stages such as the world’s famous Apollo Theater in New York, International venues in Sierra Leone, West Africa and Peck ham, London England.